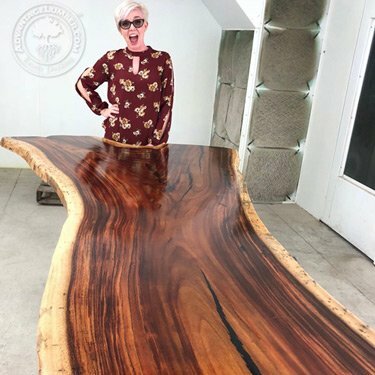 Live-edge slabs for: desk tops, conference tables, coffee tables, bar tops, gathering tables, dining room tables, kitchen islands, nightstands, wall art, and other fine furniture. We kiln dry all our slabs to kill any hidden insects and to make the wood as stable as possible. 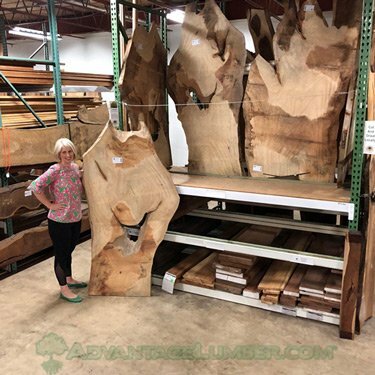 Many lumber companies only air dry their slabs, which can cause excessive warping, contractions, splitting and even insect infestation many months after installation. Board footage is calculated off of the rough sawn board before surfacing. The figure can relate to either spalt, curl, swirl, etc. All measurements and weight are approximated. Note: Slab dimensions are approximate. Finished slabs that were displayed in our showroom may have screw holes in the back/bottom face. Can't Find That Perfect Wood Slab? We have thousands of slabs not listed yet. Contact us with your size, thickness, and specie request. We will search our inventory to find you something awesome. Sorry your browser does not support frames or is currently not set to accept them. You can fill out the standard form here. 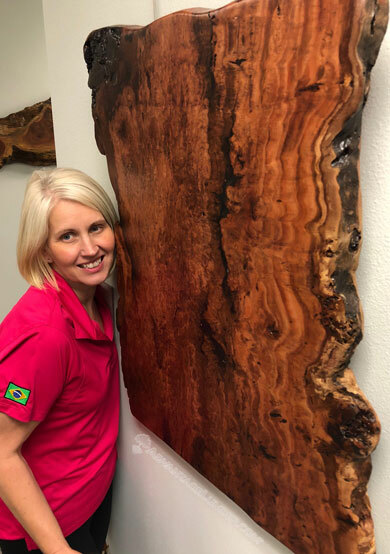 Loving on some of our wood slab artwork hanging in the halls of our corporate offices. This is one of my favorites, figured Eucalyptus. Planted in Florida bear our sawmill in the mid 1800’s there are about 5 different types of eucalyptus growing in Florida (plus a possible hybrid). Worldwide there are approximately 700 different types of eucalyptus. 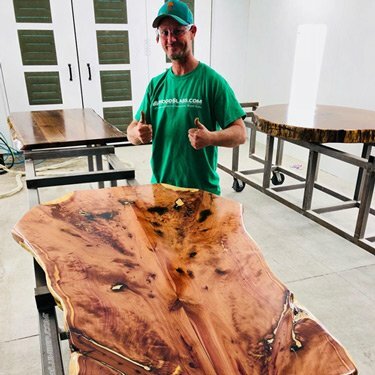 The ones we have growing in Florida produce some awesome furniture slabs. Anyone wanna play hide and seek?!? Bossman caught me hiding out in the Cocobolo (Dalbergia Retusa) Slabs today! 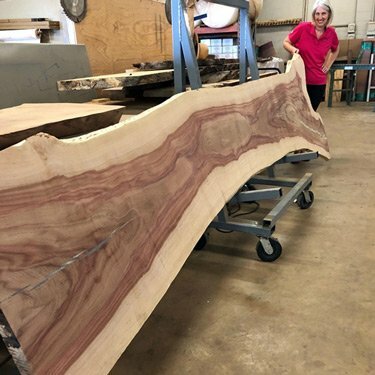 Cocobolo is one of the most prestigious species in the wood industry. It’s a true rosewood wood that defines exotic with variegated tones of red, orange and purple sometimes with dramatic contrasting black grain lines. It is hard to find and in high demand! No wonder I blend in so well! 😜 Contact us to get your hands on one of these rare beauties today! Thes slabs are available at the Florida Mill: 941-388-9299. It’s Camphor on this Wood Crush Wednesday! It’s Wood Crush Wednesday! Today we’re highlighting Camphor. We’re lucky to have Camphor growing in Florida. A lot of trees are being cut to make room for rapid land development. 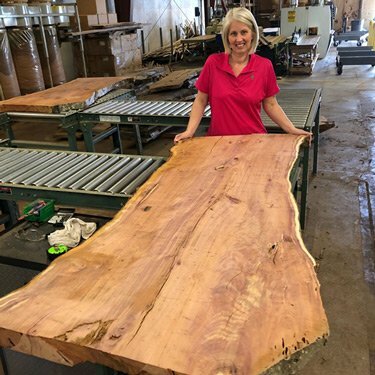 We take these trees and turn them into slabs, turning blanks, and lumber for woodworkers. We just got a container load of slabs from our Company-owned Mill in Brazil. These Angelim Pedra rounds were hidden in the back ! Also Known as the wood of angels, Angelim Pedra is a wood that has been used for many carpentry applications. It is often used for windows and doors, benches, decking, and even flooring, but rarely as slabs. 🐵 Monkey See, Monkey Do.... I bought one of these for a bar top and so should u! I had to SCREAM with joy when I saw this Monkey Pod slab in the spray booth! These trees can grow to a large size, reaching heights of 50 to 80 feet, making them perfect for large table slabs. This one has a crotch at the end giving the grain a unique wavy pattern that’s desirable to the eye. Want one just like mine? Browse the slabs below to grab one of its brothers or sisters! Use code: ASHLEY5 - at checkout to get 5% off! 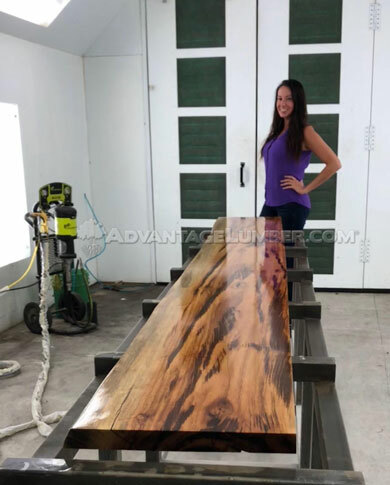 Bookmatched Aromatic Florida Cedar Slab table and our in-house Slab Master Tobi Jack at home in the spray booth. Book matching the consecutive cut off the log makes a mirror image down the centerline. We ship these slabs worldwide for table tops, bar tops, shelves, benches, wall art hangings, etc. 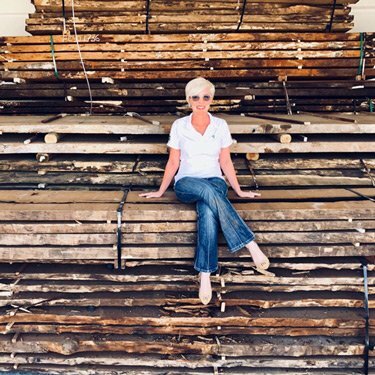 Getting my hands DIRTY at our Florida Sawmill today! The boys and I nicely organized some Brazilian slabs that just came in from our Company-owned Sawmill in Belem. Sometimes they just need a women’s eye to get things clean and organized! 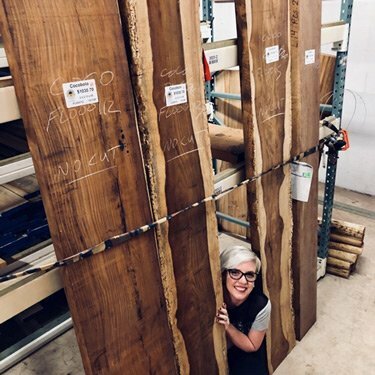 These Cumaru, Angelim Pedra, Tatajuba Jatoba, Cambara and Quaruba slabs will make perfect dining tables, conference tables, bar tops, and desks! Contact us now to get your hands on one of these exotic beauties! Sniff, sniff! 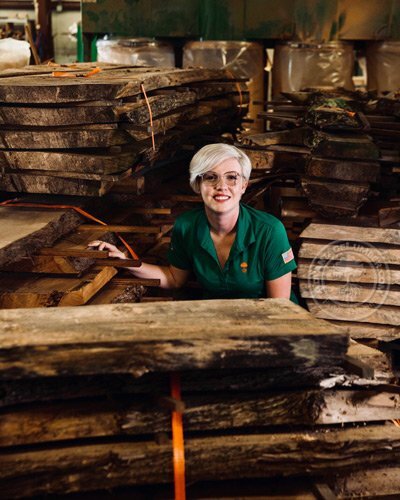 Everyone loves the smell of aromatic cedar day at our sawmill. We are surfacing live edge table slabs for our inventory. 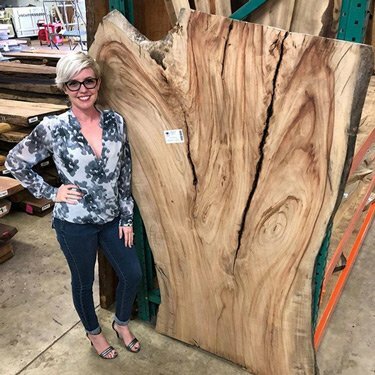 🤒 This beautiful fever tree slab is giving me one! If it was still the 1800’s you most likely would of boiled the bark off this Fever Tree for the fix to Yellow Fever. 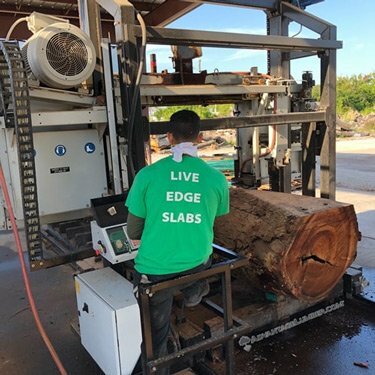 Cutting some Monkey Pod logs at our Florida Sawmill today. These logs come from our Urban Log Recycling program which salvages trees growing along city streets. They have been felled either by storms or removed due to disease, insect damage, deemed invasive, or at the end of their natural lifespan. We have thousand of kiln driedslabs not listed yet so please call us for your next project. We also offer surfacing, sanding, and finishing options. 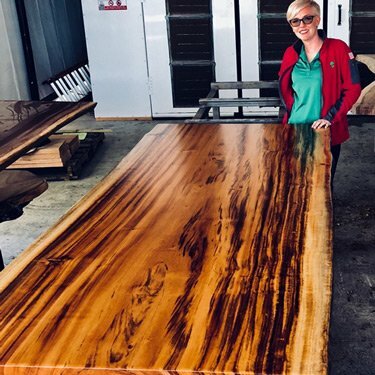 Who cuts salvaged Banyan trees into table slabs? We do of course! The Banyan tree was first brought to Florida by Thomas Edison in the late 1800’s in his quest to invent a way to make synthetic rubber at his estate in Fort Myers. These trees can cover more than an acre in size and yield very crazy shaped slabs. You can even mount a plant box under the holes in the center and have some plants growing in the holes of your coffee table slab. Some folks just hang them on the wall as art. No matter which way you decide to use them they are certainly unique little descendants of Ol’ Thomas!!! 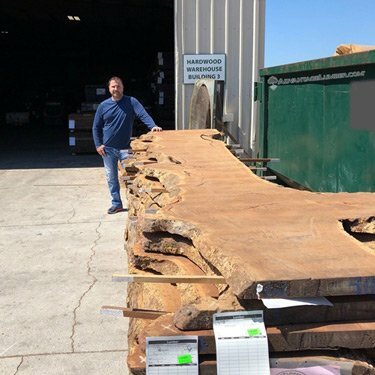 This is one massive Eucalyptus slab from our Urban Log Recycling Program! 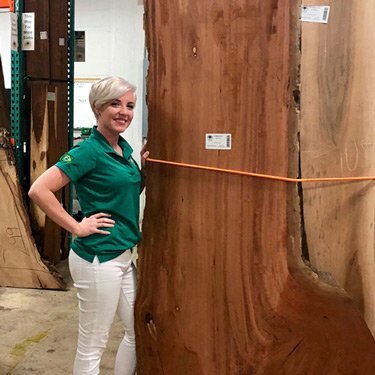 🙀 Ahhhhh the slabs are taking over the Mill in Florida! Cedar, Cypress, Norfolk Island Pine and Indian Rosewood came out of the kiln today! Do you know what that means? That means we have 100s of new slabs that will go up on the website this week. If your extra excited, like me, you can stop by and look through them before the rest of the world does. Don’t forget to ask for a VIP tour! 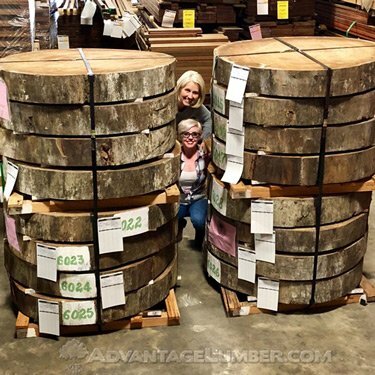 These babies are located at our Sarasota, Florida Sawmill but we also have many slabs to choose from at our other U.S. 🇺🇸locations. Santa Fe Springs, CA / Grover, NC / Buffalo, NY. If your feeling extra adventurous you can visit one of our Mills in Brazil! 🇧🇷 We love visitors! © WoodSlabs.com . All Rights Reserved.